Tompkins County Dept of Social Services sponsored National Transit Institute's "Managing Community Mobility" class in Ithaca, NY in April 2010 and 2011. 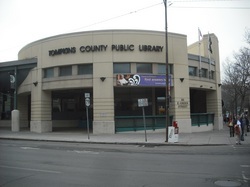 The class was held at the Tompkins Co. Public Library, 100 E. Green Street, in Downtown Ithaca. James J. McLary, Region II and VII FTA Ambassador for United We Ride, taught the class in 2010 to 41 participants. Jana Junkler Brule', Project Manager of BerkshireRides (CTAA), taught 24 people in the 2011 class. A total of 65 people received mobility management training. As shown in Table A., twenty-three (23) counties in Upstate NY were represented by 58 participants. Five staff from New York State Department of Transportation and two Canadians took the class. The benefit of hosting the class is illustrated by having 19 participants from Tompkins County, 29% of the total. Below are files from the 2011 class CD ROM.